Congenital heart surgery outcomes analysis requires reliable methods of estimating the risk of adverse outcomes. In the past, methods used for risk adjusted comparisons of outcomes from congenital heart surgery relied on expert opinion about perceived complexity of treatment. The development and growth of national and international congenital heart surgery clinical registry databases has resulted in the availability of large datasets for analysis. The adoption by these registries of standardized nomenclature and definitions and their use of a uniform set of data elements has made it possible to apply robust statistical methodology to these large sets of objective data to develop empirically based tools for analysis of mortality and morbidity associated with congenital heart surgery. The Society of Thoracic Surgeons – European Association for Cardio-Thoracic Surgery Congenital Heart Surgery Mortality Score and Categories (STAT Mortality Categories) and the Society of Thoracic Surgeons Congenital Heart Surgery Morbidity Score and Categories are now widely used in reporting of outcomes, in quality assessment, and in outcomes research. *Indicates that this Procedure, Score, and Category were not included in the original JTCVS publication . The original list of procedure codes was based on Version 2.5 of the STS Congenital Heart Surgery Database. These additional procedures represent the list of new procedure codes that were added to The STS Congenital Heart Surgery Database in 2010 as part of the upgrade to version 3.0, and have also been incorporated into the EACTS Congenital Heart Surgery Database, and The Japan Congenital Cardiovascular Surgery Database (JCCVSD). 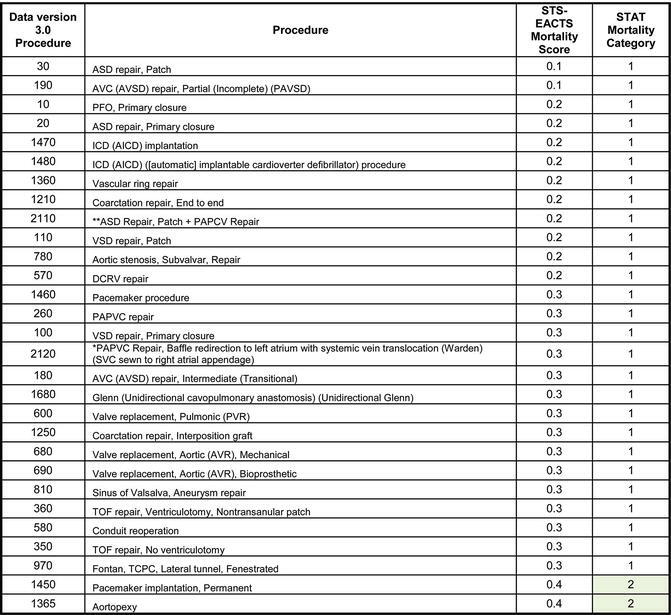 To assign scores to these new procedures, a panel of highly experienced congenital heart surgeons from programs representing a variety of programmatic volume categories were surveyed and asked to provide an STS-EACTS Mortality Score for 26 procedures that were new to version 3.0, using the scores in the Table of the JTCVS article  as a guide. The mean of the scores from these ten surgeons was then used to assign the STS-EACTS Mortality Score and STS-EACTS Mortality Category for these 26 new procedures. (When the highest and lowest scores were discarded, the scores were essentially the same. [9/23 scores did not change, 13/23 scores change by only 0.1, and 1/23 scores change by 0.2]). **Indicates a combined procedure (made up of two or more component procedures). ***Indicates a combined procedure and also a procedure for which the Score and Category were not part of the original JTCVS publication  and were assigned later as described above. RTI International. Methodology, U.S. News & World Report, Best Children’s Hospitals 2013–14. Available at: http://www.usnews.com/pubfiles/BCH_Methodology_2013-14.pdf. Accessed 23 Jan 2014. Gupta P, Jacobs JP, Pasquali SK, Hill KD, Gaynor JW, O’Brien SM, He M, Sheng S, Schexnayder SM, Berg RA, Nadkarni VM, Imamura M, Jacobs ML. 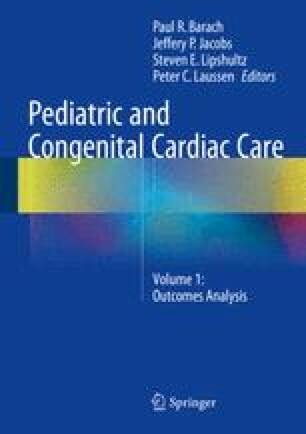 Epidemiology and outcomes following in-hospital cardiac arrest after pediatric cardiac surgery. Proceedings of 50th annual meeting of the Society of Thoracic Surgeons; Jan 2014. Available at: http://www.sts.org/sites/default/files/documents/pdf/annmtg/2014AM/50AM_AbstractBook.pdf.